On the front, I distressed watercolor paper by using gel medium to attach some text, and then promptly pulled it off. 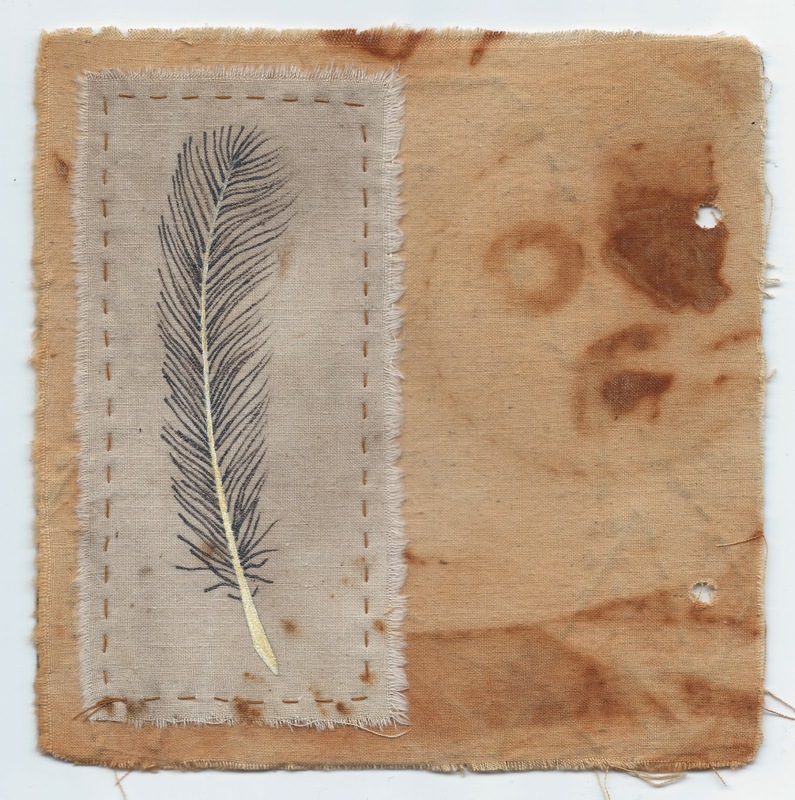 It left some texture on the top, and then naturally distressed the page of text which I collaged onto the bottom. 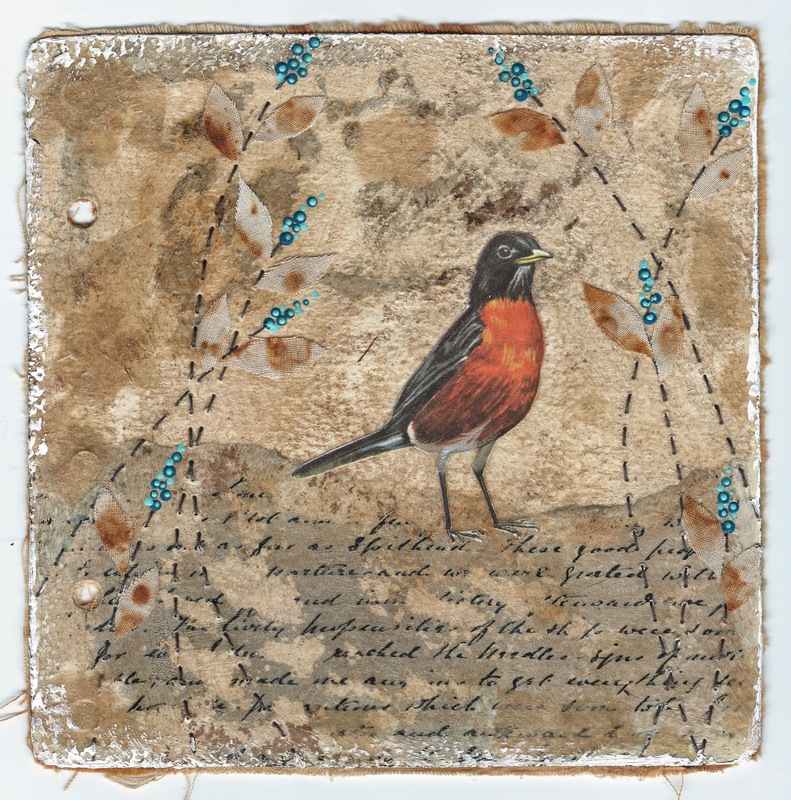 I found a robin illustration out of an old encyclopedia and added plant life which I stitched and painted. Afterwards, I aged the edges and added some pieces of dress pattern paper to areas I thought needed it. On the back, I went with something a little simpler by using some fabric that I'd rusted as a base for hand sewing on another piece of fabric that I had painted with a feather. Overall, a very fun and satisfying piece to work on! And now I can let my cat out of the bag...it was my pleasure to paint the Easter candle for the 4th year in a row. 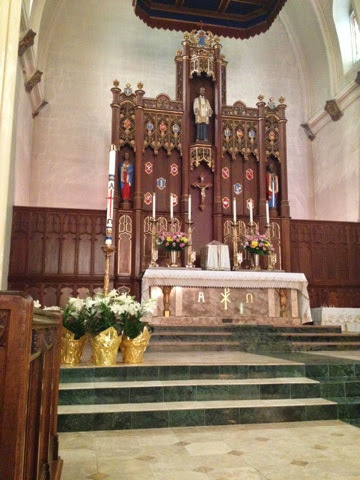 A view of the Easter candle on the altar of our church, St. Vincent de Paul Catholic Church. A close-up of the phoenix. I got a fabulous tip from one of our religious brothers who is an artist...to carve the design into the wax with an x-acto knife. It kept the paint within bounds and made the waxy, curved surface very cooperative to paint. Blessings to him for making the work easy so I could do a more complicated design! Now, why would anyone get rid of this doll...and why has no one adopted her? The answer could likely be in the reaction on Miso's face when I picked her up and asked if she wanted to take her home! It was a look of fear and repulsion. Poor thing, it was still there the next week. Maybe $1.99 is a bit steep. Going to thrift stores is a great love...not only do you get to see amazing, interesting things that you don't normally get to see, but you also score things that make you feel like you "got ahead". I bought what I thought was a cotton robe, and it had a tag inside from an Etsy seller. It turned out to be a handmade organic cotton wrap dress that was originally $90. It's massive on me, so I'm going to use the fabric for applique on another project. Recently, I purchased 2 yards of organic cotton fabric from Alabama Chanin. It's grown, knitted, and dyed in the USA which makes it pretty special, and fairly expensive. I'm waiting until I have some undisturbed time to work on it as I can't think straight if there is too much noise. Ha! I might be old or dead by then. Anyway, I bought it in fern green and peacock blue to make some infinity scarves that double as nursing cover ups, a tutorial I saw on a blog. I'm going to make one, Chanin-style! But I've got one itty bitty project to finish first...the Easter candle! It's all designed, cut and started. That's the hardest part. This is the "major art" on the candle this year, the phoenix rising from the flames, and nesting on a crown of thorns. I'm saving it for last as I warm up on simple letters and shapes. I'm on task for having it done by this Sunday, then it's back to sewing!